So you (purposely) forgot your brown bag at home. Not to worry, generously portioned, budget lunches abound. You done good, Dhaba Express. After 20-plus years of serving regulars at Scotia Square, PG's has settled nicely into its home on Hollis. And yes, the crazy deals remain. Some of PG's daily specials, like lasagna ($6.25) or the chicken skewer, rice and greek salad plate ($7.45), rotate throughout the week but you can chow down on a burger and fries ($6.25) or have breakfast for lunch ($3.99) every day. It also doesn't hurt that PG's owners---George and Eva Sayde---are the nicest. There's a laundry list of reasons why Indochine is a must-try, but for now focus on the Pho. A big bowl of Vietnamese soup starts at $5, and is a perfectly filling, belly-warming meal for a crappy day. Or any day. If you think soup won't fulfill your lunching needs (though trust, it's a meal on its own) add a Korean taco for fun ($8.50). And while we're talking tacos, these hearty flavour explosions are a mere $4 each plus there are three new fusions: Caribbean, Jamaican Jerk Chicken and Trinidadian spiced chickpea. Finding a lineup out the door at Kaiser's isn't a rare occurrence and that's because this small-but-mighty sandwich counter has lunch options that'd make Subway hang its head in shame. Firstly, a "small" sub here is eight inches of goodness. Secondly, the majority of said small sammies are under $5. Thirdly, you can get these tasty, no-frills, honest to goodness subs double stuffed for a small price increase. Double stuffed, enough said. If you're punching the clock anywhere in the vicinity of Bayers Lake and are lacking in both time and money departments, there are deals to be found here. 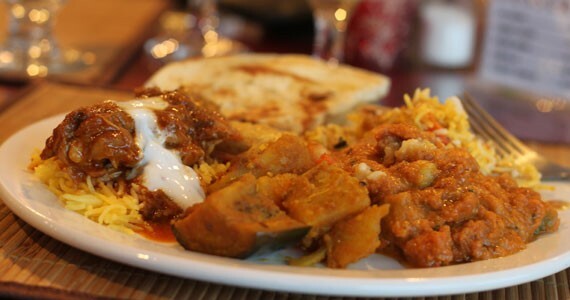 Dhaba's take-out lunch specials are available Monday through Friday and offer six curries, served with rice and salad. For not much more than your pocket change, dine on chickpea curry ($6.99) or up the ante to vindaloo for an extra loonie. Why is it that the most unsuspecting spots usually are the best? This diamond in the rough welcomes you eat yourself into a lunchtime food coma (the good kind) with a bunch of weekday specials to gorge on. So you'll have to break the $10 mark, but for combos that include miso soup, rice, sweet potato noodles, kimchi and salad (plus a main, like bulgogi beef or shrimp teriyaki). A little $10.45 goes a long way. Hey you, person who's ever referred their lunch as "just a sandwich"--- I dare you to go to venture north to Sully's and see how "just a sandwich" treats you. A measly $6 can get you one hell of a roast (local!) beef sammie, or sub full of roasted and marinated veggies. The little north-end hangout also boasts pretty darn affordable smoked meat and pulled pork sandwiches ($7.50, and you know they're piled high). Pull up a stool and enjoy or, if need be, Sully's delivers. Spice up your Dartmouth lunch routine by paying a visit to Cheese Curds' feisty little sis, where the ingredients are fresh and plentiful and the tacos are flavour-filled and cheap. Like, $2.75 each cheap ($7.75 for three). Load up these bad boys with every fixing imaginable, close your eyes and head to Woodside wonderland. If you've got a hankering to heat it up on the Halifax side, hit Cantina Mexicana downtown (1551 South Park Street) for quesadillas and burritos so hefty you can save half for dinner ($8.26). Noon is a pretty great time at many local Thai restaurants, because they know the meaning of a bountiful lunch special. ChaBaa offers most of their best dishes---like masaman, red and green curries---in lunch form (with a side of rice, and a spring roll) for $10. It's a lot of food. This homey Dartmouth Cafe gets big points for the fact that a huge portion of its soups and sandwiches run for under five bucks, and its paninis for under eight, not to mention its daily specials. Our Thyme also partners with Elizabeth Fry Society so when your mind's on your money (and your tummy) theirs is on the community. Few foods are more filling than a bowl of noodles, and few dishes more of a staple in a penny-pincher's diet than ramen. The truly friendly folks at Truly Tasty offer a few lunch specials, the cream of the crop being a combo of the house ramen and those delectable pan fried dumplings ($10); comfort food that'll help you and your wallet over the mid-week hump.